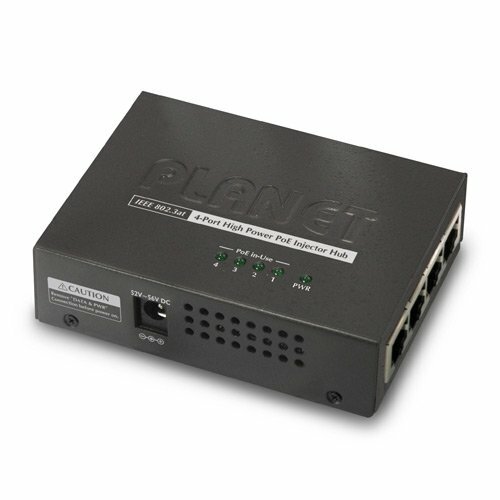 The HPOE-460 from Planetechusa.com is a quality injector hub that features 52V DC power for a 802.3af / 802.3at remote powered device without interferring with the data transmission ability. This unit provides more power than the 802.3af PoE PSE and it offers fast and reliable network deployment. The HPOE-460 showcases 15.4 / 30.8 Watts PoE power for up to 4 remote power devices and it is an affordable way to upgrade your current network system from IEEE 802.3af to the IEEE 802.3at without purchasing a brand new ethernet switch. The front panel of this device features 8 RJ-45 ports, and 4 of those ports work as "data input" ports, while the over works as "PoE data and power output." The "PoE (Data and Power) output" ports also double as power injectors that send DC voltage to a CAT. 5/5e/6 cable. This sends power and data at the same time between the injector and the splitter.